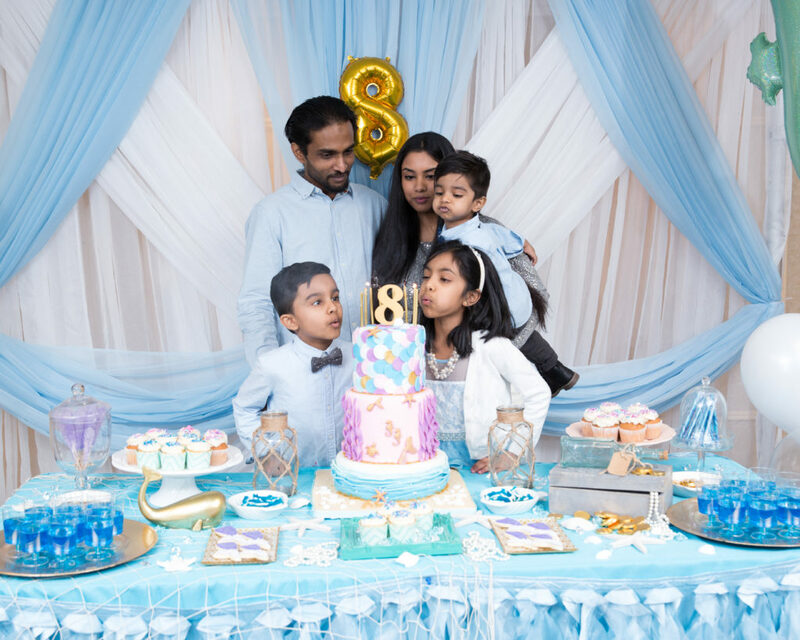 Akshaya turned eight this past December, but this time I decided to hold off our annual celebration until January of this year. Every December, I get overwhelmed with all that goes on during that month and having to organize and host a birthday party has always added to that stress. I was extremely happy with this decision and I couldn’t have asked for a better party. 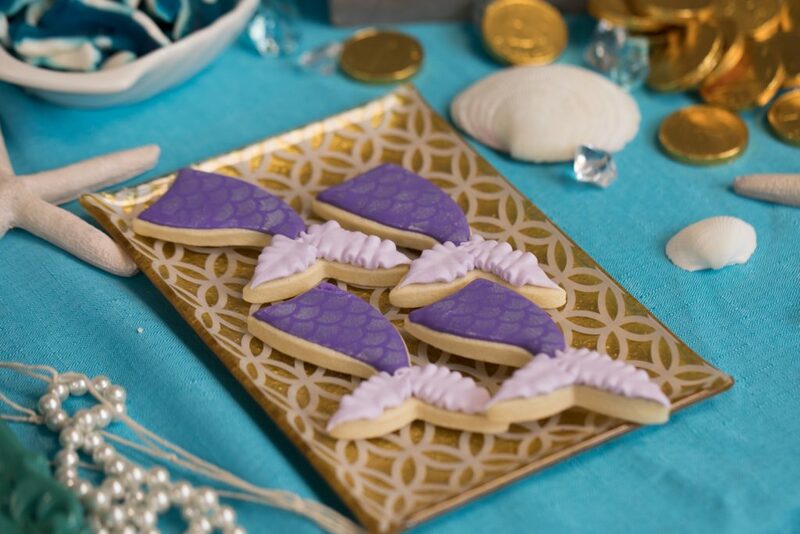 This year, Akshaya requested a mermaid/blue theme. 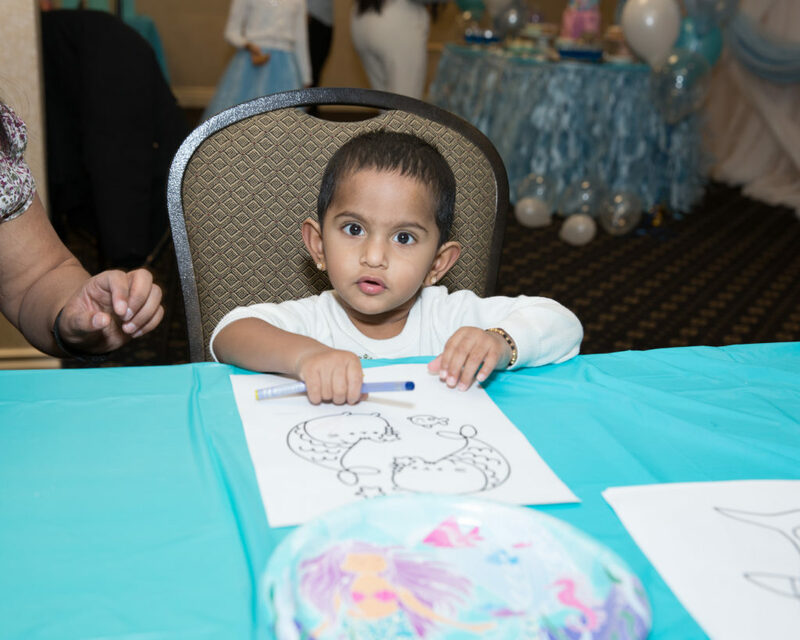 She actively participated in the planning aspect months prior and helped choose all her party décor – she is very opinionated (which, I like to think is great because she knows exactly what she wants). 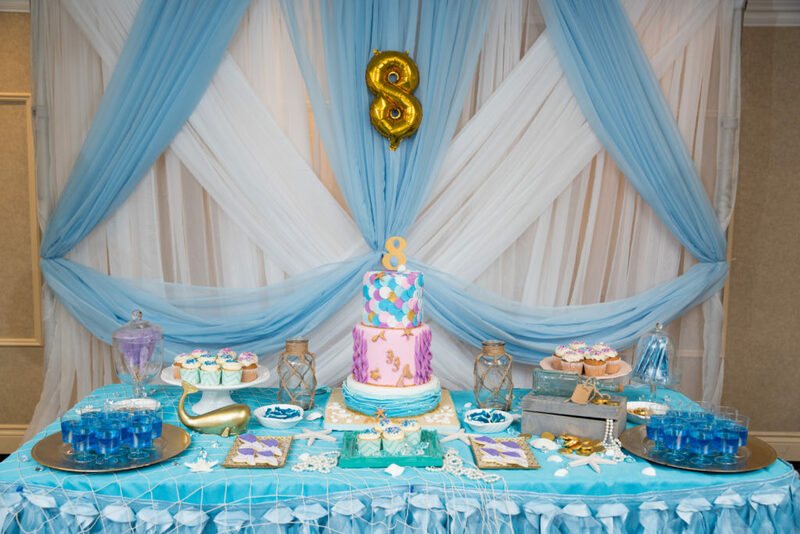 I wanted to go with an aqua blue and purple theme but my daughter wanted a light blue theme so that’s what we settled on. 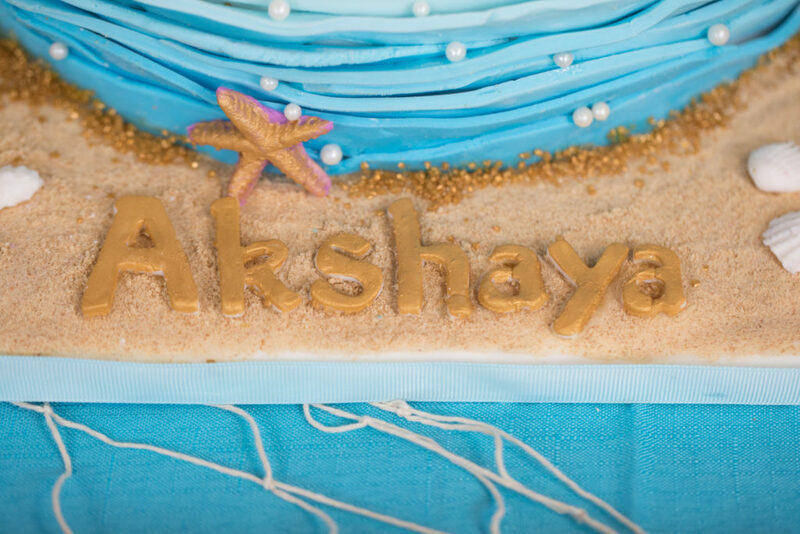 Once we settled on a theme and colours, Amily of AR Inks, designed the most spectacular birthday invitation for Akshaya. From this invitation, to my logo, the boys’ invitations from last year, and all her work that is up on Instagram, it is evident that Amily not only has talent but she has a passion for design. 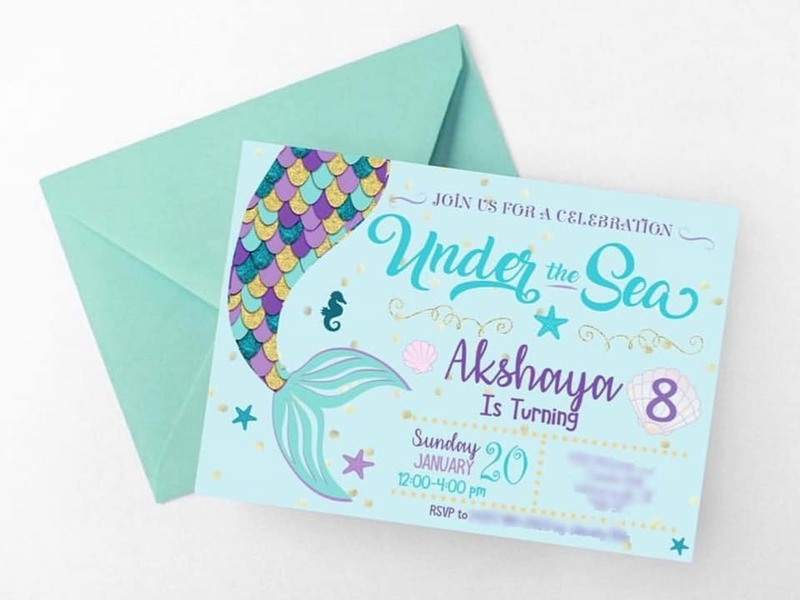 She executes everything so perfectly and we couldn’t have been happier with the invitation Amily designed for Akshaya’s party. 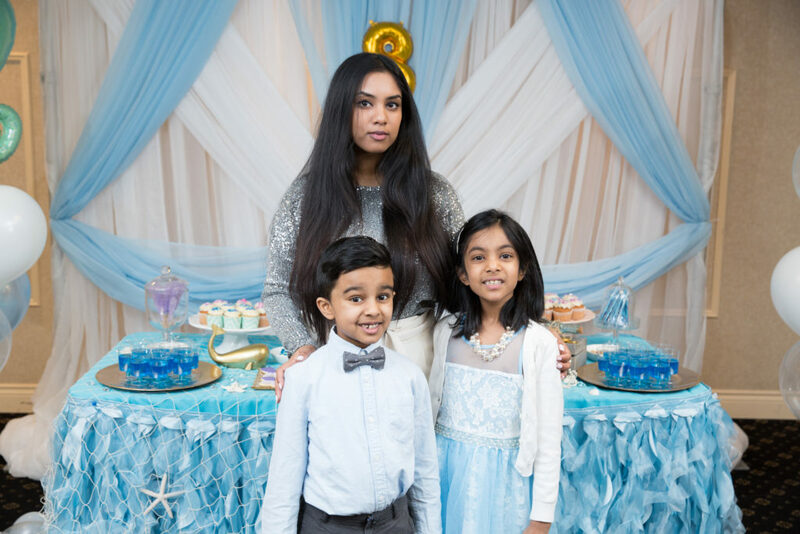 Theresa from Kandy Krush Party Set Up put together a simple, yet elegant and airy backdrop, which complimented our theme and table set-up perfectly! I love how she was on time and worked diligently to have everything set-up before guests arrived. 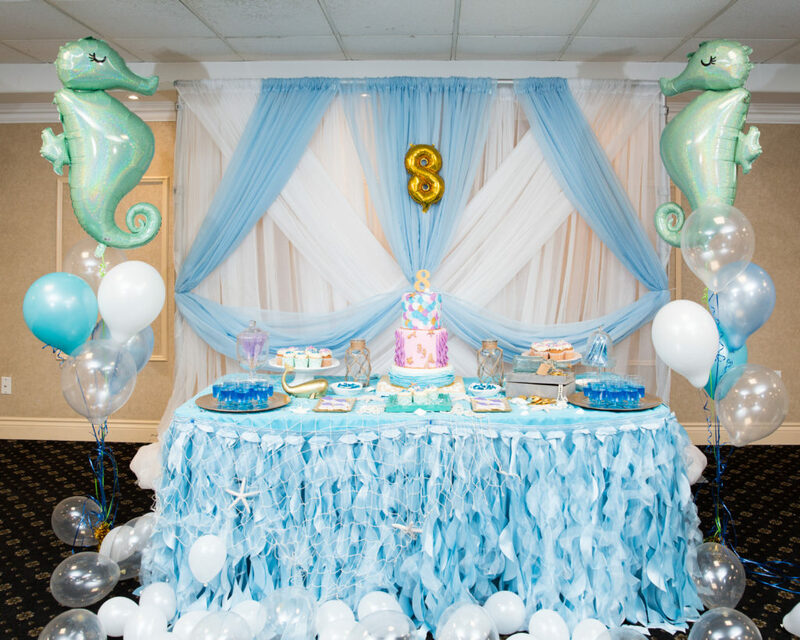 She also provided me with a beautiful table skirt which complimented the “under the sea” theme beautifully! 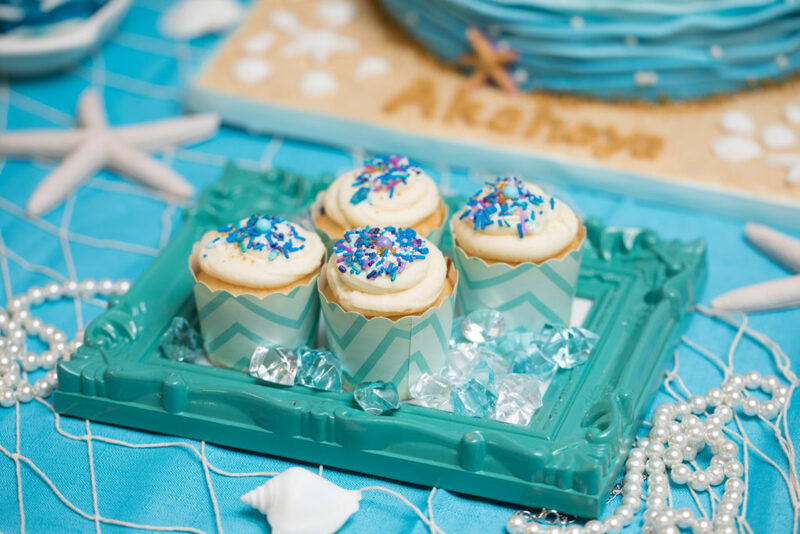 If you have yet to check her out, you can find Kandy Krush Party Set Up on Instagram here. 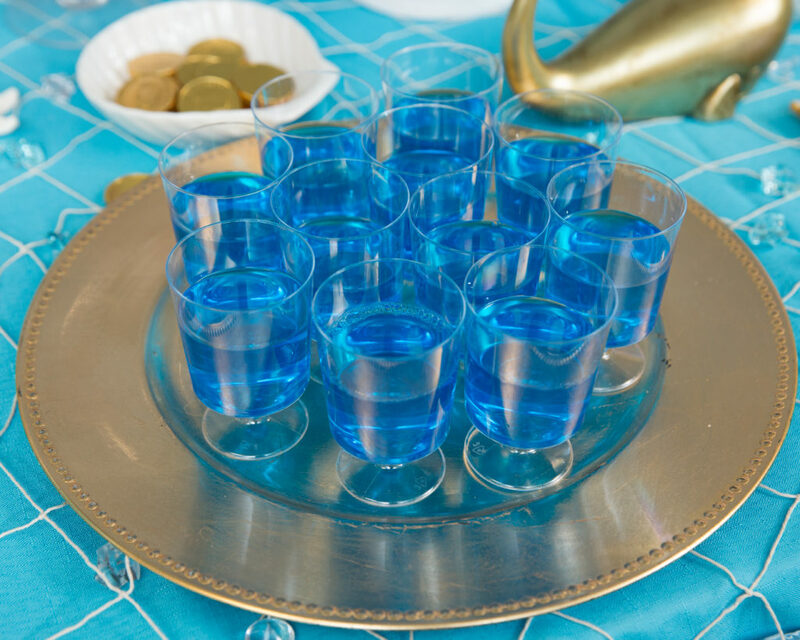 Theresa has put together the most extravagant, bright, colourful, themed parties for years now. The cake was made by me, as usual. 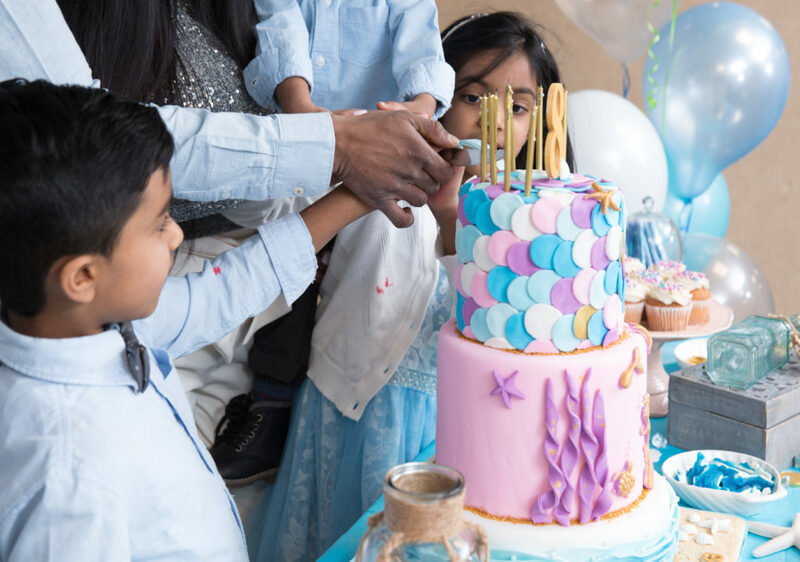 It is the one thing I hope to do for my kids for every birthday. 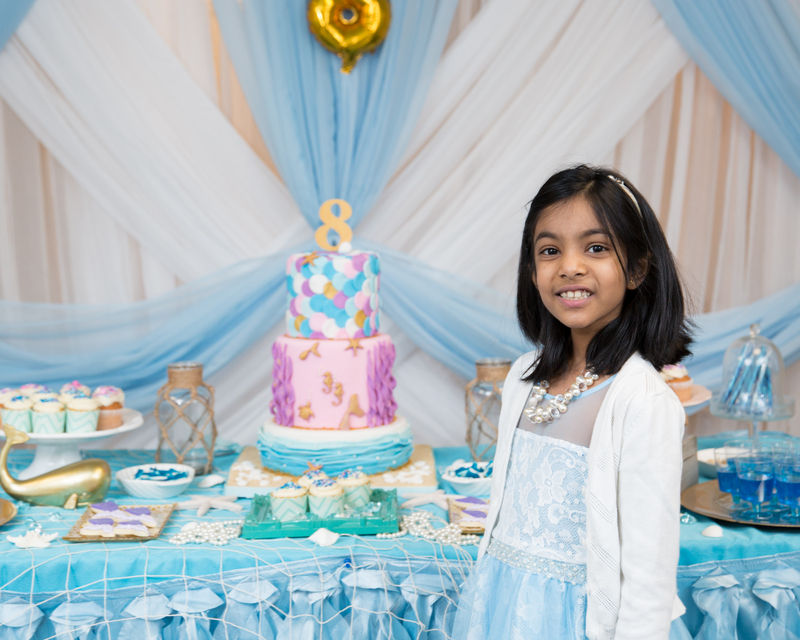 This year since the party was held in January, well after the holiday season, I was able to actually enjoy the process of making and decorating Akshaya’s cake from start to finish. The inspiration for this cake came from a post I had seen on Instagram. 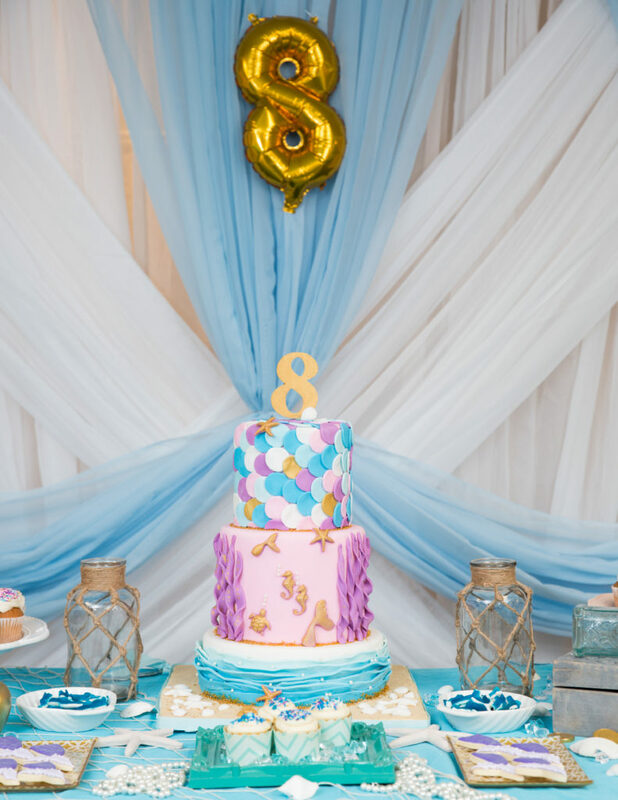 The pale blues, pinks, and lavender, went perfectly with Akshaya’s choice of a light blue theme, while providing the necessary contrast. I’m slightly obsessed with adding touches of gold to cakes, so I definitely added gold. 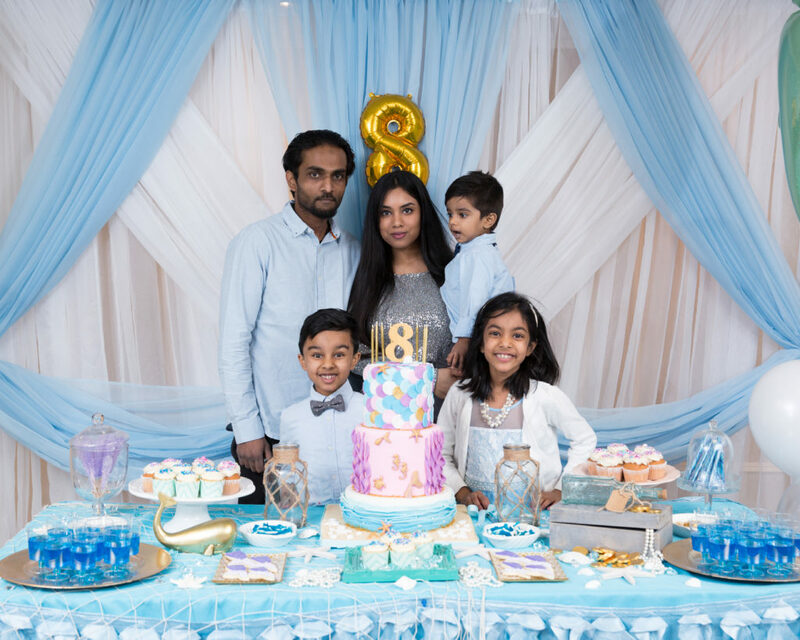 I picked up on that gold by adding a gold number 8 balloon in the centre of the backdrop as well as gold serving plates and gold coins on the table. 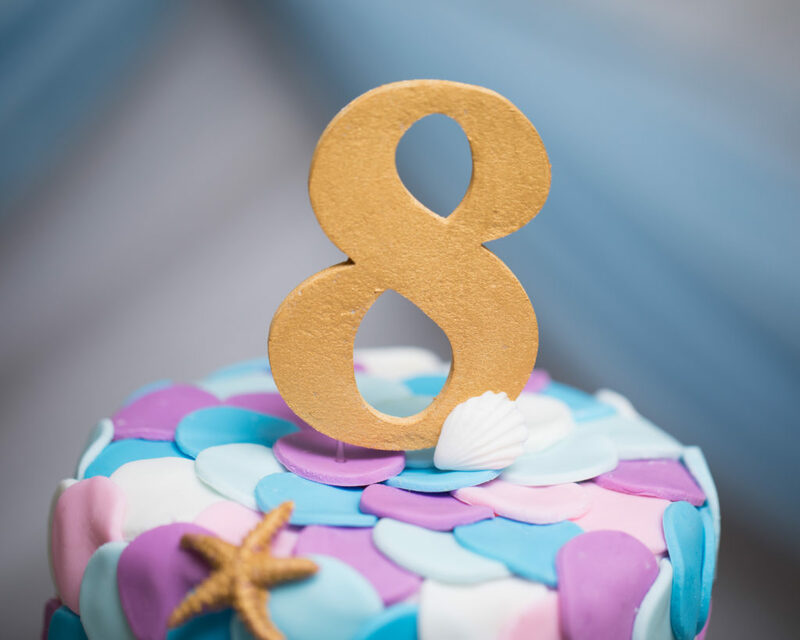 The number 8 cake topper was purchased from Micheal’s Arts and Crafts Store, however I stripped it of the original shiny gold covering and painted it with edible gold paint so that it blended in with the rest of the cake. 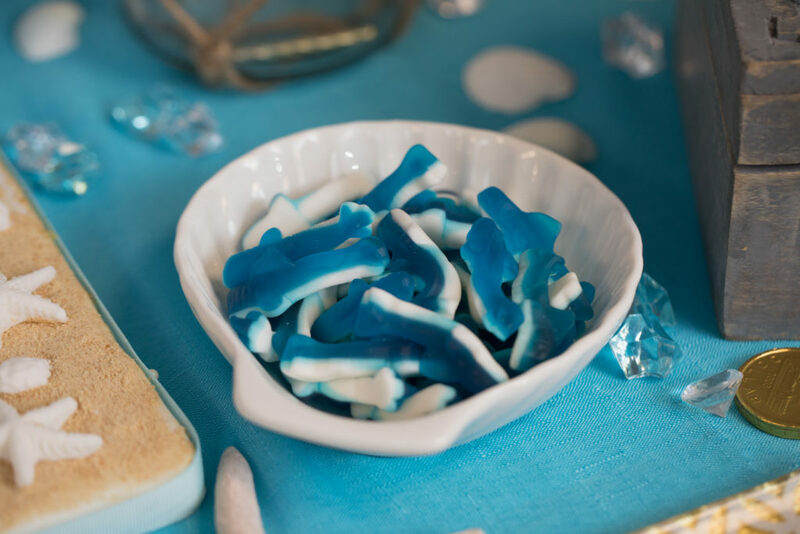 Sweet options included cupcakes, a variety of candy including shark gummy candy and gold coins, bright blue jello, and gorgeous mermaid tail cookies by Kirsten of Four Sweet Cookies. 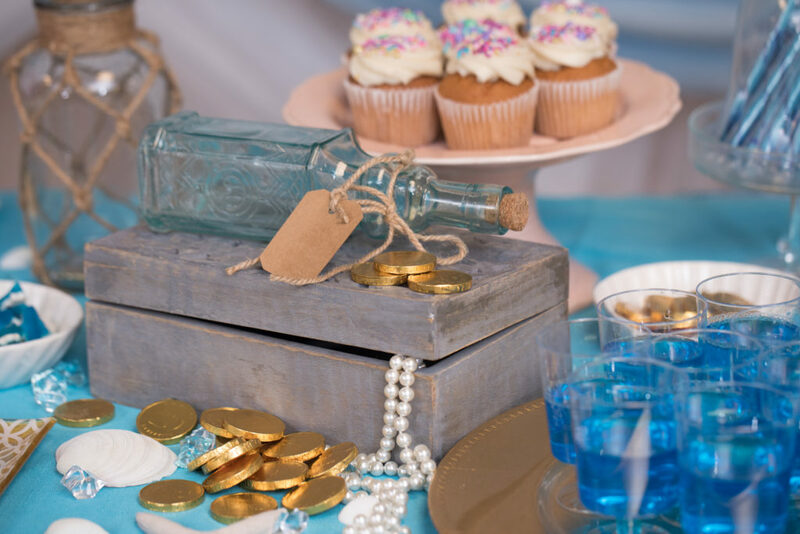 I decorated the cake table with strands of pearls, crystals, seashells, and a make-shift treasure box filled with gold chocolate coins to compliment our under the sea/mermaid theme. The little details always make huge impact and pull the look together! As with any children’s birthday party, a party just isn’t complete without balloons! I ordered seahorse foil balloons online during the summer and had them inflated at Party City for a small fee when I placed my order for the helium latex balloons. I also bought tiny white and pearl balloons to resemble bubbles. 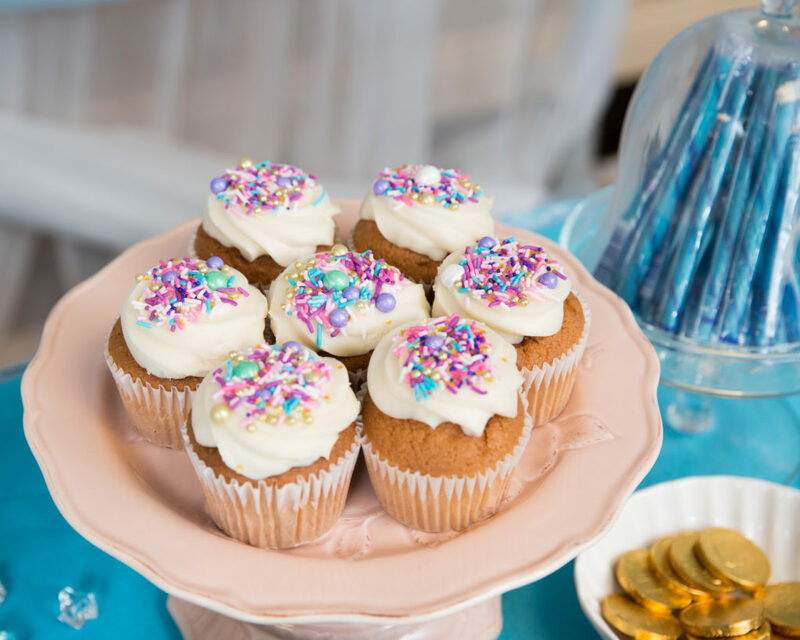 They looked great placed around the cake table and the kids enjoyed playing games with them as well. Perhaps, more important than balloons is the entertainment and we had such awesome entertainment at this party. 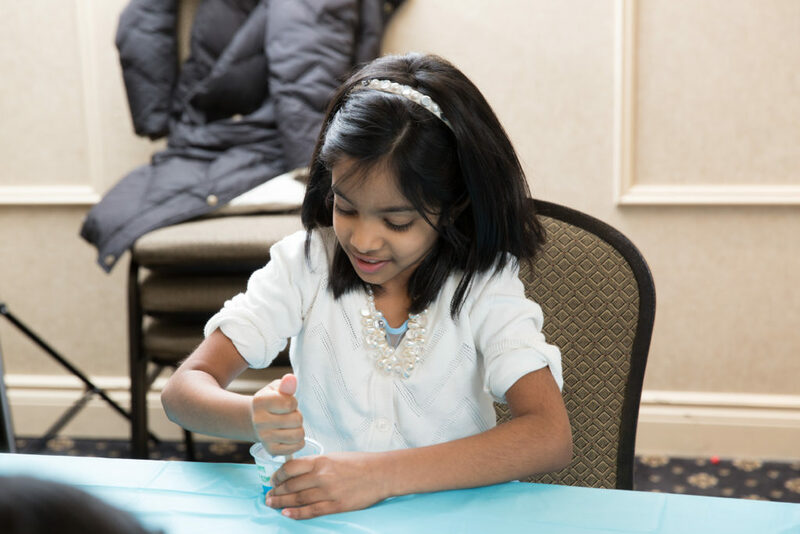 Akshaya has been stuck in the slime craze for almost an year now and when she asked if we could make slime for her party, I just couldn’t say no. 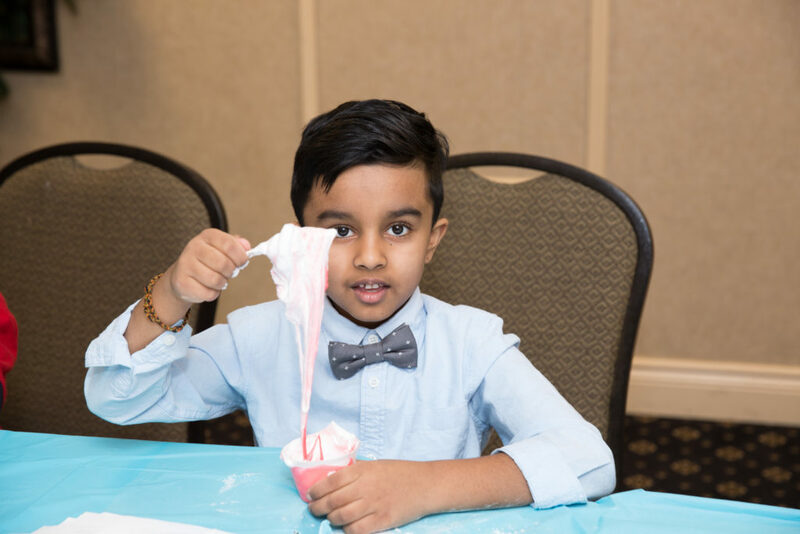 A quick google search led me to Zoum Zoum Party, which not only offered Slime Parties, but also caters to all of Canada. I was so impressed with Zoum Zoum Party. It was so easy to book my party with Karen and everything I needed to know was clearly explained in detail. Our host, Sunshine, arrived on time despite the poor road conditions that day, and set up promptly. I didn’t have to do a thing – She brought everything she needed with her and cleaned up as well. 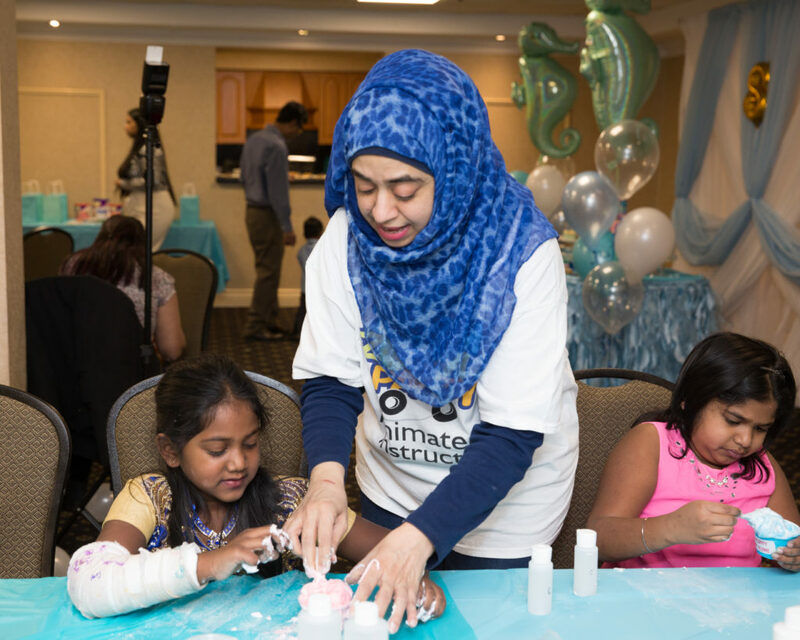 Sunshine kept a group of 16 children, happy and engaged as she walked them through the slime-making process. She was incredibly friendly and upbeat. 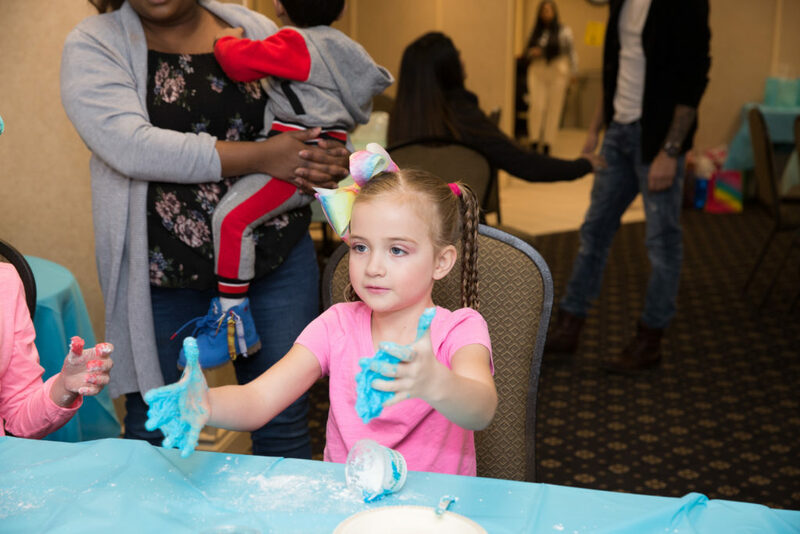 The kids had a blast making three different slimes to take home. 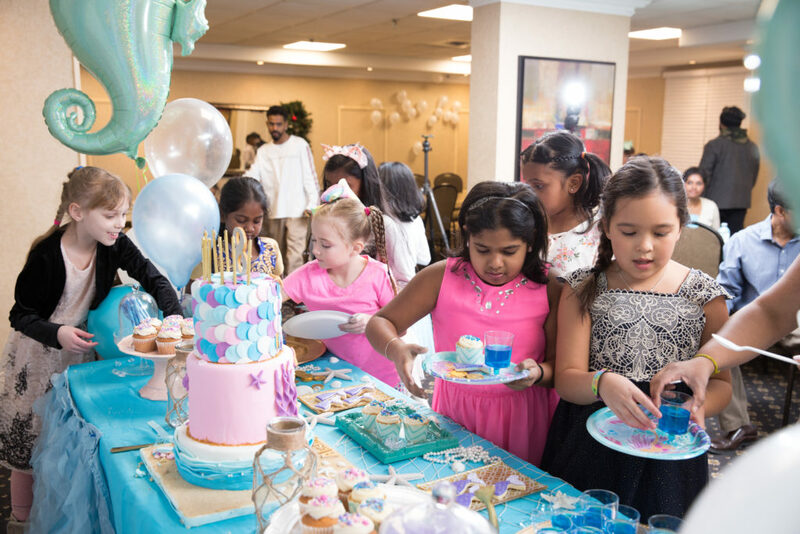 My daughter and her friends declared that it was the best party ever. A few of the moms even contacted me the next day asking for the party service that I had used. It was a huge hit! 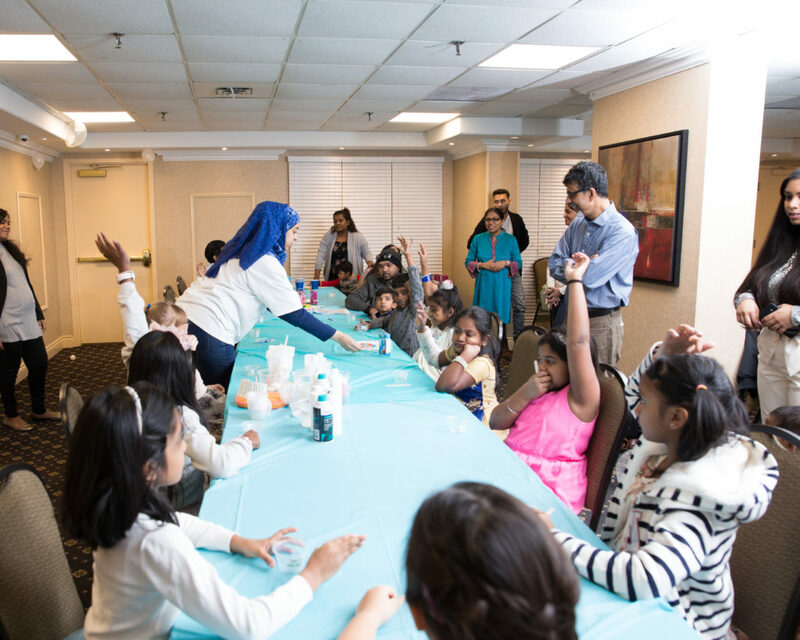 In addition to Slime Parties, Zoum Zoum Party also offers Girls Party, Magic Party, Hip Hop Party, and Science Party. The pricing is not only very reasonable, but well worth it for what you get. 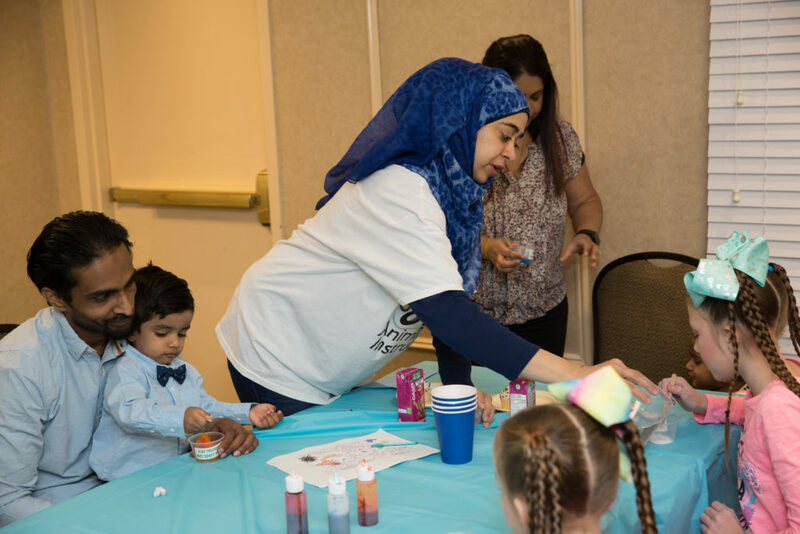 It is a party service I will be using again in the near future and I highly recommend it to those looking for an entertainment company for their child’s next event. 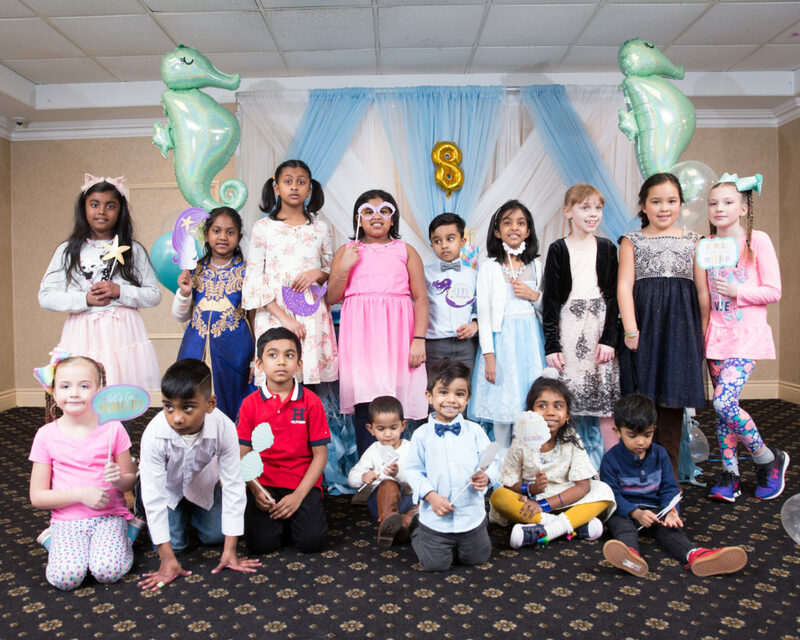 All in all, Akshaya and her friends had a wonderful time. 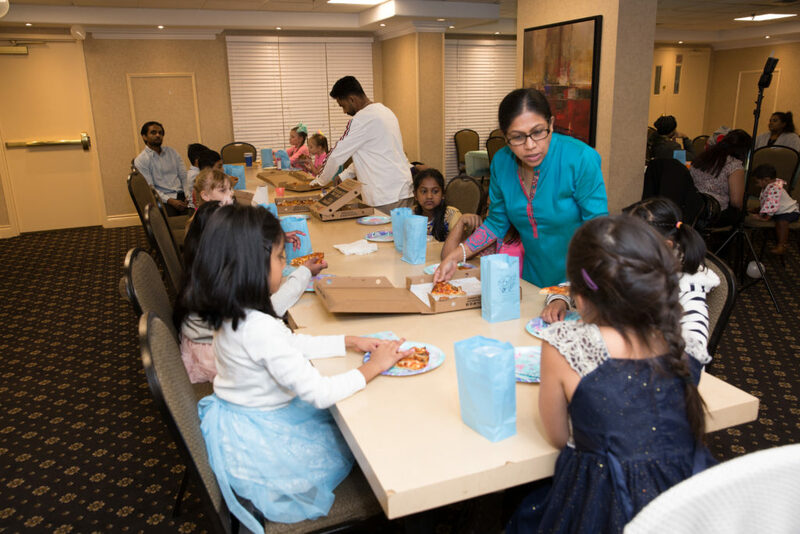 They coloured, ate pizza, played games, made slime, and ate sweets until they were content and then took home their loot bags filled with more treats, play-dough, and bubbles. 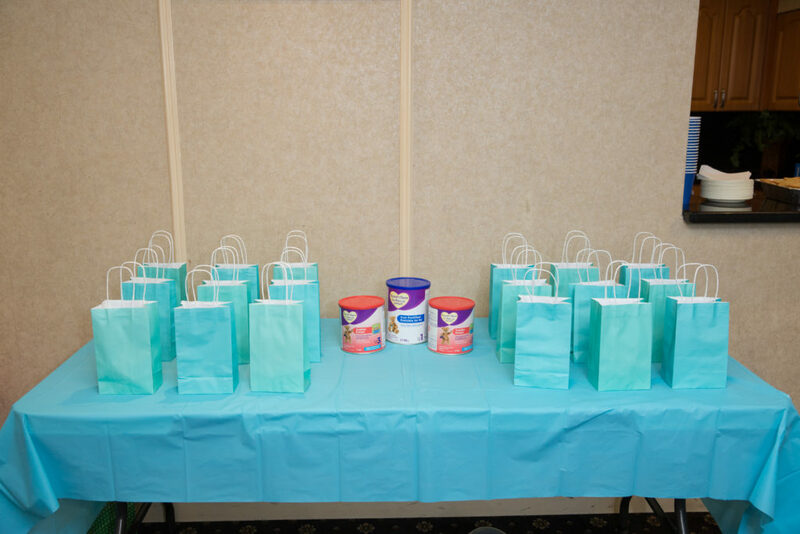 The best part of this party was that Akshaya had decided to ask each guest to bring in a can of baby formula instead of a gift, if possible. 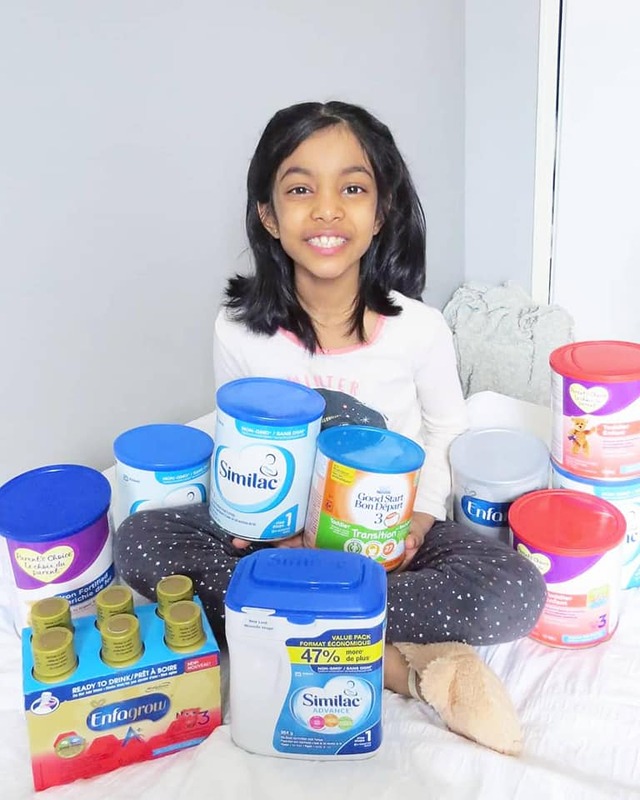 She collected 10 tins of formula to donate to the food bank. I couldn’t be prouder of her! Photographs courtesy of my friend’s talented husband, Dilipan of D-Touch Images. He is patient and thorough, making sure to get all those important, detailed, and fun shots. 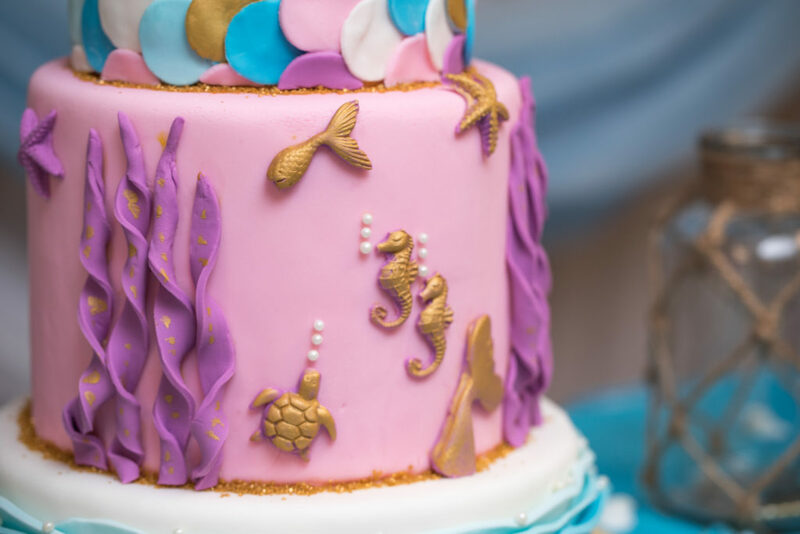 I was so impressed with all the detailed shots of my cake. You can check out his work here.